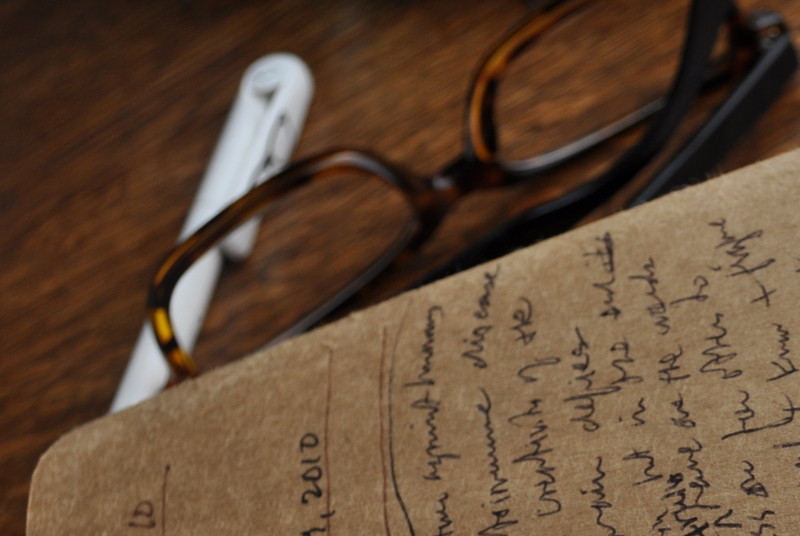 For years on my daily morning walks I carried small notebooks and a pen for ideas about stories, homeschooling, etc. Even though I obviously know the value of the spoken word, (being an oral tradition storyteller), for some reason I felt better about writing the notes. Until one day my walking cohort, Sharon, basically told me I was crazy to not use a digital recorder—how can you possibly write as fast as you think…and walk at the same time? I had my system and was reluctant to change. It’s one thing to leaf through a cute little stack of colorful Moleskines, and even though I can’t read them sometimes, I like my pages of “chicken scratch”, as my dad would say. But this recorded business seemed like much more work: batteries, ear buds, wrestling with that devilish little white cord and THEN…remembering where the heck those valuable messages ended up in an unfathomable digital galaxy, floating around with hours and hours of other stuff I forgot I’d thought or said. All that changed when I decided to interview my characters. Maybe I just like talking to myself, but I really got into verbalizing the ideas. 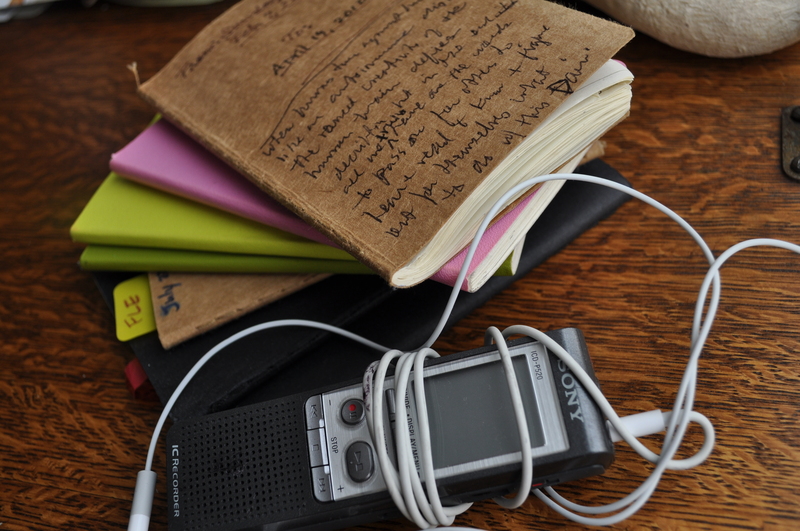 Notebooks turned into audiologs to index messages. In play back, the immediacy of “our” voices, cadence, and reflection helps dialog ring true. So I make the digital recorder thing work because of good results in the end, but to be honest—I missed my note books, and for somebody who’s so on top of it, I’m under it, it’s easier to crawl out from under a stack of notebooks than hitchhike to and from Digiland. So I now do both, and that suits me fine. I think each characters finds its own way to speak to us and they decide how they want their truth to be told. We have to be open to their path and not try to force our will on them or put words into their mouths because they turn on you if you do. And just because they let you interview them onetime doesn’t mean they don’t want to lecture you the next or just let their actions speak for them. We just have to listen and be open. Anita, you’ve given us a nice insight into the writer’s “ride”–or in your case the writer’s “stroll” and what it is like. People sometimes wonder why and how writers write, and you show the answer–the joy and enchantment of it to the writer in the daily activity of it. Also the relentless compelling aspect of it, as these characters and ideas sometimes do not leave the writer alone, but demand to be listened to and expressed or otherwise dealt with. Rewards, and even publishing aside, this is the fun (and obsession) of being a “writer”! This is how a writer sometimes goes on a very long time without recognition or even a mode of public expression. The joy and commotion and excitement of the inner life that you convey is where it is at, and really the meat and potatoes of writing. The finished product and external response are obviously important but not what keeps a true writer going, rather the wonderful “daily stroll” as you describe it with one’s characters and even inner angels and demons wanting to be heard and embodied–that’s what keeps you going — and makes it impossible to stop, too, taking the writer safely over any obstacles or “bumps in the road” as these often pass barely noticed in the rush of the inner life and also the daily responsibility of trying to be true to these characters and ideas and give them their proper form and accurate expression (which is the rigorous re-writng discipline). When you interview your character, is it you interviewing or a persona, or do you even imagine some other character interviewing your character? I interview as myself, the writer (as much as I know who THAT is from moment to moment!). And I like all the possibilities you listed. What’s your experience with character development? Any tips?